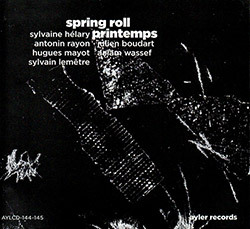 Picking up from flutist Sylvaine Helary's 2015 Ayler release "Spring Roll/Printemps", this evolved album of chamber jazz performed with Hugues Mayot on saxophone & clarinet, Antonin Rayon on piano & Moog, Sylvain Lemetre on vibes & percussions, and Kris Davis on piano, presents sophisticated compositions from Helary, Davis, Rayon Dan Blake, and Matt Mitchell. 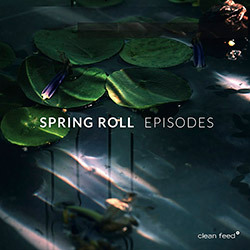 Winners of the Jazz Migration and tour JMF 2018, the chamber jazz trio of Sophie Bernado (bassoon), Hugues Mayot (saxophone & clarinet) and Rafaelle Rinaudo (harp & effects) share their passion for creative music that embraces composition and improvisation, springboarding off composers like Debussy while transferring warmth and vision into free jazz; magnificent. 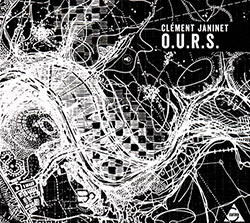 French violinist Clement Janinet composes music for quartet inspired by the lyricism of the free jazz melodies of the 60s (Ornette Coleman, Phoraoh Sanders, &c.) and the timbral and rhythmic textures of repetitive music (Steve Reich, Philip Glass, John Adams, &c) in several quartet configurations including bass clarinet, tenor sax, bass, drums, guitrar, and cello. A hybrid of theater, music, sound poetry and political manifesto from Sylvaine Helary, focused on the "Arab Spring" in Egypt, using intertwining words and voices around the quartet performances of Hugues Mayot, Sylvain Lemetre, Antonin Rayon and Sylvaine Helary.